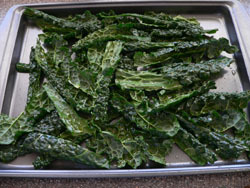 Kale chips are baked not fried making them an incredibly healthy snack rich in vitamins and protein. Baking makes the kale a crisp salty treat that even the kids will like. Wash and take out the stem kale. Spread out onto a baking sheet. Spray the kale with the Salad spritzer. Sprinkle with Parmesan and salt. Bake for 10 minutes or until crispy. Serve immediately! Try a little sprinkle of any of these for a little variation. Parmesan cheese, garlic powder, Cheyenne pepper (careful on this one) or use a seasoning blend.